I've been wanting to learn how to use acrylic paints for quite a while. I figure if I can paint watercolor then acrylic should be a breeze right? Well it is easier to learn, but it is not a breeze. Not sure if any of these are marketable yet, but my newest painting (sunflowers) is much better. All of these except for the sunflowers are ACEO's which are Art Cards, Editions or Originals in a 2 1/2 x 3 1/2 inch size, so they are quite small. 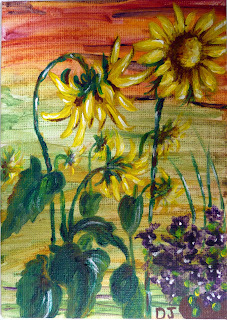 The sunflowers is a 5 x 7. I really wanted to start painting some ACEO's and thought this would be a good opportunity. I probably should have started out with a larger size to get a better feel of the canvas and paints, but it is what it is. I think they're all beautiful! Happy New Year!